Living in modern day America can be hard on anyone. I know it's hard on me at times. All the hustle and bustle, the traffic, and the constant stress do a huge number on all of us. Sometimes we just need a little pick-me-up. A few years ago, when I started my formal herbal studies, I was introduced to Rosemary Gladstar's Zoom Balls. These little candies are a great way to get that much needed energy boost, and they're also a great way to include more healthy herbs into your daily routine. Since then I have created a large variety of variations of her Zoom Balls. Here are just a few to get you going. 1. There are a few things in life that make everything taste better; chocolate, caramel, and chai. The best thing about chai is that while it makes everything taste better, it also makes everything healthier. So here is my favorite energy candy recipe. Mix all the herbs together and set aside. In a large mixing bowl, mix together tahini, almond butter, and honey. In a separate bowl, mix together remaining ingredients. Slowly combine the two mixtures until a thick paste is formed. Roll this paste into balls about 1 inch in diameter. Roll the formed balls in the remaining spice blend. Store in an airtight container in the refrigerator. *Kola Nut contains caffeine, if you prefer to make this recipe without the caffeine, replace the Kola Nut with an additional ¼ cup of Eleuthero. 2. Green tea is one of the newest flavor fads in the culinary world. However, it's also loaded down with amazing health benefits. It's no wonder that I had to try an energy ball recipe using it. In a large mixing bowl, mix together tahini, almond butter, honey, and raisins (optional-puree the raisins first). In a separate bowl, mix together remaining ingredients. Slowly combine the two mixtures until a thick paste is formed. Roll this paste into balls about 1 inch in diameter. Roll the formed balls in Matcha Green Tea Powder (about 2 tablespoons) (optional-1 ½ tablespoons Matcha, ½ tablespoon coconut sugar). Store in an airtight container in the refrigerator. 3. Every now and then we all need to treat ourselves. These energy candies do just that. * Guarana contains caffeine. If you would like to make this recipe without the additional caffeine, replace the Guarana powder with an additional ¼ cup Eleuthero powder. In a large mixing bowl, mix the cashew butter, sunflower seed butter, honey, and chocolate chips. In a second mixing bowl, combine remaining ingredients. Slowly combine both mixtures until it forms a thick paste. Roll out the paste into balls about 1 inch in diameter. Roll the formed balls in about 2 tablespoons of carob powder. *Optional- Dip the balls in melted, dark chocolate. Store in an airtight container in the refrigerator. 4. All the cocoa flavor without all the misgivings, plus fruit. How much more can you ask for? In a large mixing bowl, combine tahini, cashew butter, and honey. In a food processor, combine raisins, blueberries, and goji berries. Process into a thick, sticky paste. (Alternately, dice all the dried fruit into small pieces instead of processing into a paste) In a separate bowl, combine all other ingredients, except raspberry powder. Slowly mix together all 3 mixtures until a paste is formed. Roll the past into balls about 1 inch in diameter. Roll the formed balls in the raspberry powder. Store in an airtight container in the refrigerator. 5. 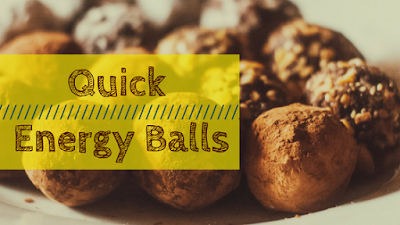 “Everything but the kitchen sink” can be found in these energy balls. In a large mixing bowl, mix tahini, almond butter, and honey. In separate bowl, combine all other ingredients. Slowly, combine both mixtures until a thick paste is formed. Roll paste into balls about 1 inch in diameter. Roll the formed balls in about ¼ cup toasted coconut. Store in an airtight container in the refrigerator. For anyone interested in Rosemary Gladstar's recipe, here's the video! In any of these recipes, feel free to change the ingredients around. Play with different powdered herbs and dried fruits. Use a wide variety of nut butters. Have fun, play around, and let me know what you think below!